Details on Sunday’s deadly Las Vegas concert shooting that left 58 dead, 515 injured. 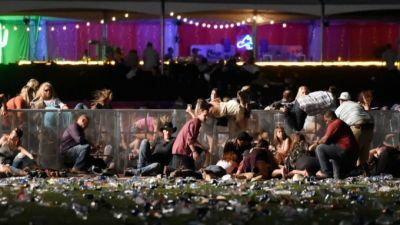 (NBC News) A lone gunman released a rapid-fire barrage of bullets from a 32nd-floor Las Vegas hotel room late Sunday, killing at least 58 people and injuring more than 515 others at an outdoor country music festival, police said. It was the worst mass shooting in modern American history. The shooter, who was identified by law enforcement officials as Stephen Craig Paddock, 64, of Mesquite, Nevada, fired shot after shot from the Mandalay Bay Resort and Casino down on the crowd of about 22,000, sending terrified concertgoers running for their lives.